New Delhi: Tomatoes are now being compared with nuclear weapons. In Pakistan Occupied Kashmir (PoK) and houses of stone pelters, tomatoes are much in demand. There is also a price rise in tomato prices due to the demand in the Kashmir region and PoK. Interestingly, recent searches on stone-pelters houses, forces found more than normal quantity of tomatoes. Some of them claimed, they stocked up for a function while some claimed due to law and order situation and price rise, they have purchased in large quantities. According to the distributors, in PoK, which is a den for terrorists’ outfits, on Thursday and Friday almost 35 trucks were moved across from zero point on LoC in Chaka Da Bagh Poonch out of which half of them were loaded with tomatoes. From Delhi’s Azadpur Mandi, daily almost 70 to 80 trucks move to Jammu and Kashmir to supply them in Pakistan. But, now as tomato traders are not interested in selling tomatoes to Pakistan, it has been noticed that the demand of tomatoes in Jammu and Kashmir has increased and some of the stock has been supplied in Kashmir region. Also, PoK is consuming above than average quantities of tomatoes. 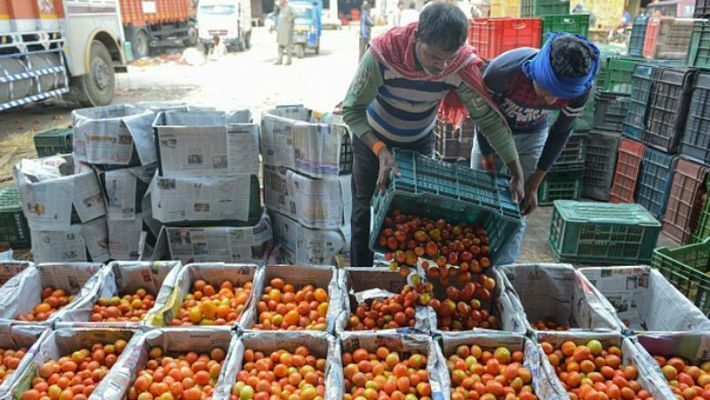 According to Ashok Kaushik, president, Agricultural Produce Market Committee (APMC) and tomato wholesaler, there is a rise in price in Kashmir in the last one week due to demand and locals are trying to send tomatoes to PoK. “Normally we send 25-30 trucks of tomatoes to Jammu and Kashmir every day and still we are sending them. But, there is price rise due to demand especially in Kashmir, Srinagar regions. Currently the rate of one kg of tomato is around Rs 50 to 60 which was Rs 25 to 35 till last week,” Kaushik said. While Pakistan is living a tomato-less life, its sympathisers living and protesting in Srinagar are stocking up tomatoes fearing price rise. Last week, as a preventive action Jammu and Kashmir Police picked up almost 150 stone pelters from different locations in Srinagar. Some of them were picked up from their houses and the local police found large quantities of tomatoes stocked up at their places. When asked, the families told the police they feared price rise due to less supply and tension so they have stocked up as there is no cheap alternative to tomatoes. “During searches there were unusual amount of tomatoes found in the houses. All of them have stocked up fearing price rise and impact of other law and order situation,” a local police official involved in the searches told MyNation. According to the local media reports, nearly 150 people, majorly from Jamaat-e-Islami Jammu and Kashmir including its chief Abdul Hamid Fayaz, were detained early Saturday morning ahead of the Supreme court hearing on Article 35A of the Constitution. Meanwhile, a Pakistan based journalist went on a rant on his news channel to criticise India’s threat of banning tomatoes to Pakistan. He used ‘tauba-tauba’ multiple times to express his anger. His video went viral on social media as people were making fun and also memes.